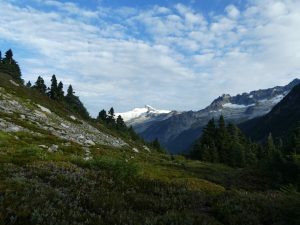 It is getting a bit late in the season for the North Cascades, but I drove up the Cascade River Road hoping to tag my last two Washington top-100 peaks in the area, Austera and Formidable. 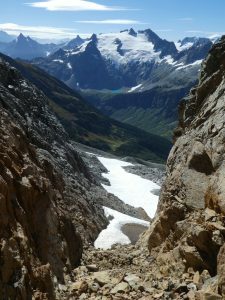 Austera is in the middle of the Eldorado-area ice cap, a long glacier-walk east beyond the standard Eldorado approach. I had done much of this when doing Eldorado, Klawatti, and Dorado Needle several years ago, and knew it would be a long but not especially difficult glacier crossing. Starting off in the mist up the increasingly well-used Roush Creek trail, I hoped to emerge into sun and dramatic views on the ice cap. Instead, I found it windy and drizzling, with temperatures probably in the 40s, far from ideal conditions for a multi-hour glacier hike. I bravely turned my tail and ran, returning to the car around noon to get warmer, if no drier. Though the forecast was the same for Sunday, I saw stars when I woke up, and it remained clear as I started up the Cascade Pass trail just after headlamp time around 6:40. The trail was every bit as hateful as I remembered, gaining 1800 feet in miles of near-horizontal switchbacks. One of these years I want to visit the pass when there is enough snow to hike or ski straight from the parking lot to the saddle. Since it had rained overnight, I was in no hurry to start up the Ptarmigan Traverse path and begin the day’s leg-washing. 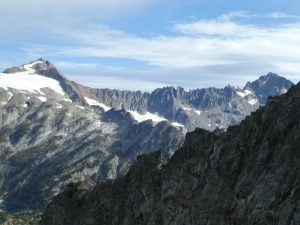 The Ptarmigan Traverse is popular enough to have developed a decent trail most of the way. However, there is still a lot of up-and-down on the route, and sections of unpleasant talus where the trail disappears. I think the route is probably best either on skis or in the early summer. I sketched my way across the nasty dirt-chute, then managed to avoid bare ice on the way up the Cache Glacier, though crampons were still nice for the hard morning snow. From the col, I followed the trail down, then across heather to Kool-Aid lake, where I was a bit surprised not to find any tents. 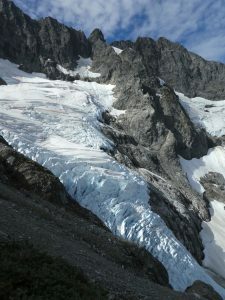 Beyond, I stemmed my way along the moat before climbing to the red ledge, then continued on more rolling terrain to the Middle Cascade Glacier. This is a fairly impressive piece of ice, descending from a col around 7000 feet to around 4700 feet in the valley below Formidable’s north face. The safest route climbs the left side, then traverses below Spider to the col, though one could probably go straight up the middle. The other side of the col is a steep couloir, with a healthy snow tongue hanging around even this late in the year. I carefully made my way down the garbage in the right-hand moat, then down some unpleasant slabs covered by loose stuff to a bench a couple hundred feet below the col. There I traversed west across snow and slabs to just below the next col, where I left the Ptarmigan trail near a campsite to cross northwest, finally getting a view of the route up Formidable’s south face. I was once again forced to descend some loose dirt here, then traverse a lot of loose talus and some snow, finally reaching the ridge leading to the summit. 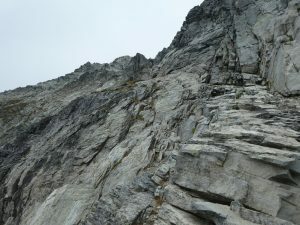 I climbed some easy rock and heather to reach the upper snowfield, then crossed that and made my way through another moat to reach the “ramp route.” After the endless approach, the last few hundred feet were actually fun. I followed a broad, clean ramp up and left across the face, then climbed blocky third class rock to the ridge just west of the summit. Looking at the register, I saw that the peak is climbed almost exclusively by people completing the top 100 list, the most recent having visited a week earlier. It looked like it might be drizzling over Eldorado to the north, and I had taken just under 6 hours from the trailhead, so I did not hang out much before starting the long, rolling return. Fortunately the rain stayed away, and the high clouds kept temperatures reasonable, so the long return was about as pleasant as it could be. I saw no one before the Cascade Pass trail, and only a few people on the run down the pass. The rainy forecast had done a good job of keeping the crowds away from what can otherwise be a zoo on a summer weekend.